Movie Maker is a simple tool that allows you to create and edit videos, but some users report that they can’t hear audio in their Movie Maker project. This looks like an unusual problem, but fortunately for you, there are few solutions available. Users report that when they add music to their Movie Maker project, the video works without any problems but there is no music available. This is an unusual problem, and if you’re using Movie Maker on regular basis this could be a big problem for you. If you’re having this issue with Movie Maker you might want to have a closer look at our solutions below. Movie Maker audio not working, how to fix it?? Windows Movie Maker no sound on imported video – This is a common problem, but in most cases you can fix it simply by restarting the Windows Audio service. Windows Movie Maker audio problems, no sound after saving, music not playing, cannot hear sound – These are some common audio problems that can occur with Windows Movie Maker, but you should be able to fix this problem by using one of our solutions. Windows Movie Maker mkv no sound – If you’re having this problem only with MKV files, the issue might be the lack of video codecs. Simply install a codec pack and the problem will be resolved. 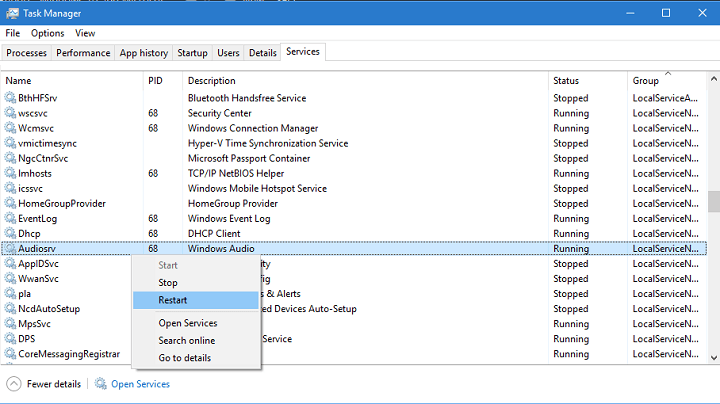 When Services window opens locate Windows Audio in list of services. Right-click the service and choose Stop from the menu. 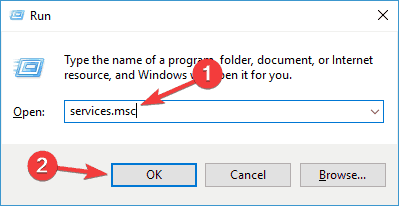 Right-click the same service again but this time choose Start from the menu. Sound should be now working in Movie Maker. Start Task Manager. You can do that by pressing Ctrl + Shift + Esc on your keyboard. 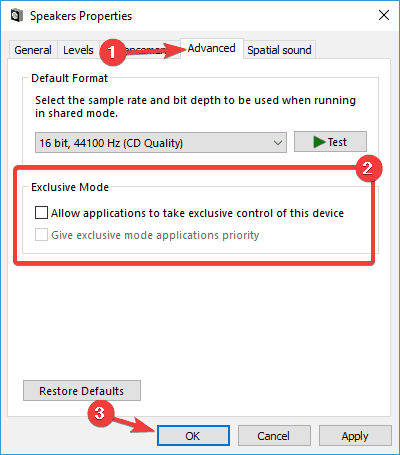 Locate AudioSrv (Windows Audio), and right-click it. Choose Restart from the list of options and after 10 seconds this service should be restarted. Although this is a working solution, you’ll have to do it every time you start a Movie Maker project or restart your computer. In the Search bar type DTS sound and click DTS Sound from list of results. When the DTS Sound window opens click the power button icon on the left to turn it off. Now the DTS Sound window should become gray meaning that it has been turned off. 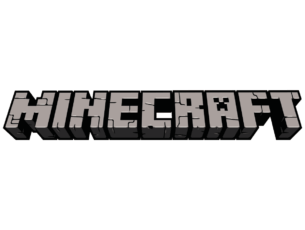 Go back to Movie Maker and try if the audio works. If you need to use DTS sound you can just set it to internal from the main screen instead of turning it off completely. It has reported that this also resolves the issue with Movie Maker. This might not be the most practical solution but users have reported that WMV files work without any problems in Movie Maker, so if you’re having any issues with sound, convert your files to WMV format and then use them in Movie Maker. This might not be the fastest or the most elegant solution, but users claim that it works. In order to convert your files to the WMV format, you’ll need an appropriate software. There are many great converters available on the market, but if you want a simple but reliable converter, we suggest you try Any Video Converter Ultimate. In addition, some users are suggesting to convert .mp4 file to .mp4 file in order to solve the audio issues. We know that this sounds unusual, but it works according to users. Alternatively, you can convert the file to .wmv format and then convert it to .mp4. Some users also reported issues while using .mp3 and . wma files in Movie Maker. However, you might be able to fix this issue by converting those files to .wav format. 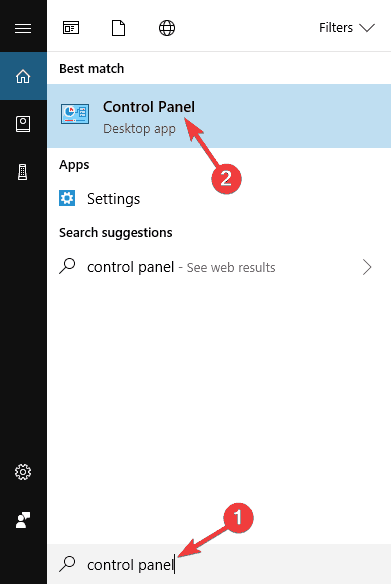 When Control Panel opens, go to Programs and Features section. 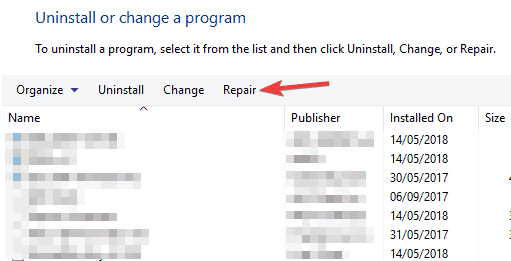 Now select Windows Live Essentials from the list and click Repair. Follow the instructions on the screen to complete the repair process. Once the Windows Live Essentials installation is repaired, check if the problem is still there. If the issue is still present, perhaps you should try reinstalling Windows Live Essentials. You can do that right from Control Panel, but that’s not always effective. Regular uninstall process can leave certain files and registry entries behind, and those files can cause problems in the future. However, you can completely remove Windows Live Essentials from your PC, by using uninstaller software such as Revo Uninstaller. Once you remove Windows Live Essentials using this tool, install Movie Maker once again and the issue should be permanently resolved. Your PC might not be able to play certain video files unless you have the proper codecs available, and in some cases Movie Maker won’t play any audio. This can be a big problem, but you can fix the issue simply by installing the necessary codecs. According to users, they managed to fix this issue simply by using the K-Lite codec pack, so if you’re having any problems with Movie Maker, install this codec pack and the issue should be resolved. 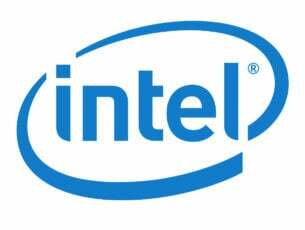 According to users, they experienced some Movie Maker audio issues on their PC, but they managed to fix the problem by installing QuickTime. This is a multimedia player, but it comes with certain video codecs, and once you install it, you should install the necessary codecs as well. Once the codecs are installed, the problem with audio in Movie Maker should be resolved. 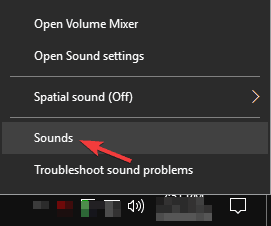 Right-click the Sound icon in your Taskbar. Now choose Sounds from the menu. 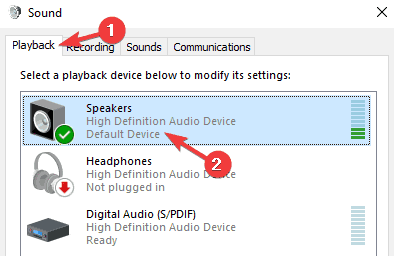 Go to the Playback tab and double-click your current audio device. In our case that’s Speakers, but it might be different for you. Go to Advanced tab and disable all option in Exclusive Mode section. Now click Apply and OK to save changes. After making these changes, the issue with audio in Movie Maker should be completely resolved. According to users, sometimes issues with audio in Movie Maker can occur due to compatibility issues. However, you can fix this issue easily by setting Movie Maker to run in compatibility mode. 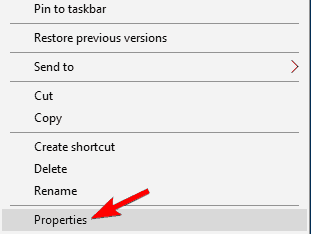 In case you don’t know, Windows has a Compatibility Mode feature that allows you to run old applications. Locate the Movie Maker shortcut, right-click it and choose Properties from the menu. 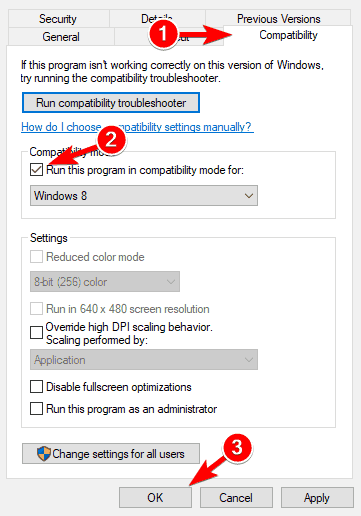 Now navigate to Compatibility tab and check Run this program in compatibility mode for. Select any older version of Windows and click Apply and OK to save changes. After doing that, try to start the application again. 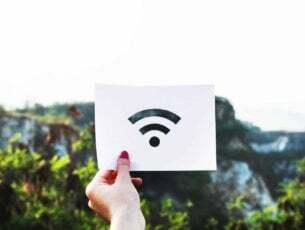 If the problem still occurs, you might have to experiment with your settings and try different versions of Compatibility Mode. If you’re keep having audio problems in Movie Maker, perhaps you should consider switching to a different video editing software. Even though many users are familiar and comfortable with Movie Maker, you should know that Movie Maker is an older software, and issues such as this one can occur. If you’re frequently editing videos, perhaps you should consider switching to a different video editing software. CyberLink PowerDirector 16 offers great features, and it’s great if you want to perform smaller adjustments or create professional videos. 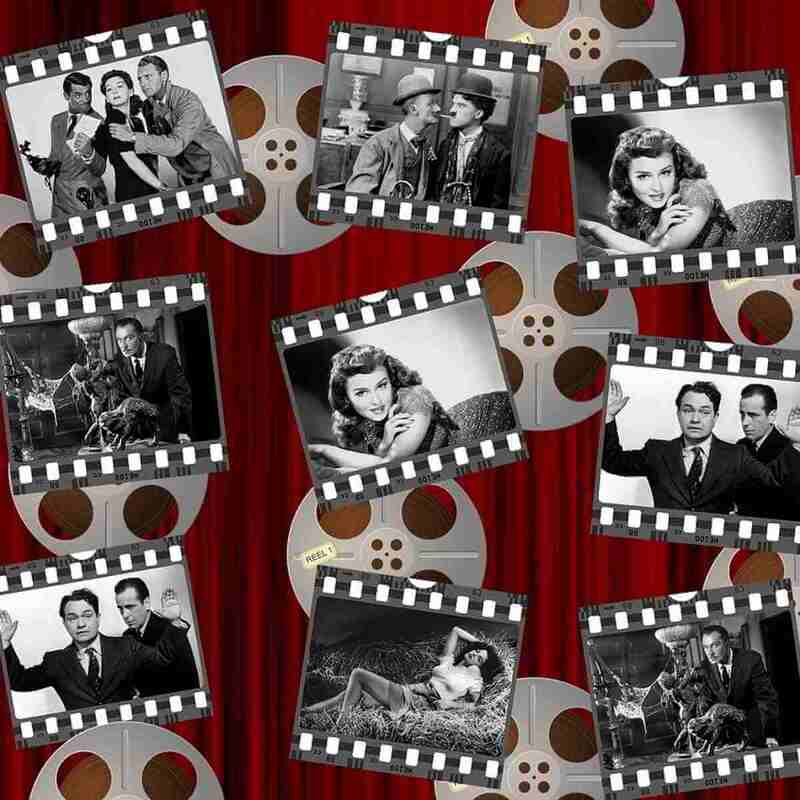 If you’re looking for a proper Movie Maker replacement, be sure to try this tool. Audio problems in Movie Maker can be annoying, but you should be able to fix most of them using one of these solutions.